In 2001 three artists - at the time all students of the Warsaw Academy of Fine Arts - launched a mobile platform for artistic activity: The Szu Szu Flying Gallery. 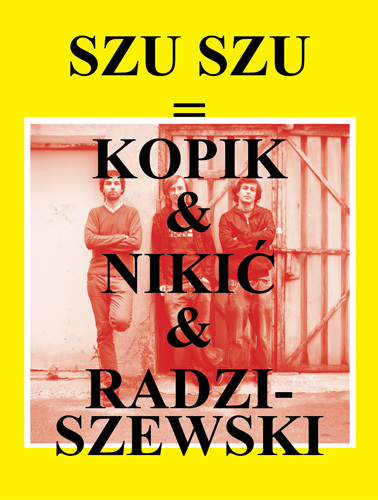 It served Piotr Kopik, Ivo Nikić and Karol Radziszewski as a model for cooperation, presentation and communication, based on an autonomous form of organization and cooperation with other artists. The trio has formed a group grounded in action, with no permanent address, each time sparking up a situation where art can spontaneously flourish in a new, specific context. Szu szu functions as a formula for collective activity characterized by process, action and event. The group's primary field of interest is the city and ways of maneuvering between reality and forms of art, the significance of context and visual forms for societal relations and for bringing about an open stage for communication. Operating most often on the basis of a DIY strategy, they take on a range of the roles typically ascribed to the art world system (curator, artist, critic, producer), while testing the boundaries set by the ideals of professionalism and amateurism. Its strategy avoids any unilateral designation or definition - which in itself figures among the group's founding principles. At the same time, szu szu represents one of the few remaining examples in Poland of the relatively atypical "artist-run space" - a gallery managed by the artists themselves.